Beautiful, spacious mansion on a large private property in one of Spain's most exclusive gated communities. Set in a lush forest, it offers many activities: a big outdoor swimming pool, tennis courts, playgrounds, hiking and biking tracks, etc. At only 75 km. from Madrid. The house has an indoor surface of 350m2 and is built on a fenced private property of 6200m2. On the ground floor there is: a large, double-height living room with a fireplace, tv and billard table, and with access to the large covered terrace with garden furniture and a dining table for 10; a glass conservatory with a large dining table for 8; a fully equipped modern kitchen with a fireplace and a small dining; a washing room; a full bathroom; and the double master bedroom with a large bathroom ensuite (with a yacuzzi tub and a shower cabin), and a direct exit to the covered terrace. On the second floor are a balcony-corridor overlooking the living room, 2 double bedrooms (one of which with a sofa on which a small child can sleep), and a full bathroom with a bath tub. The house is situated in one of Spain's most beautiful and luxurious gated communities, in a large forest with lakes and with lovely villas spaced generously. Guests can make use of the large, 33x12 m. outdoor swimming pool, of the tennis courts, pingpong tables, of several playgrounds and of the social club and restaurant. The house has 2 bicycles at the disposal of guests. This house belongs to my friends Gregoria and Eduardo, university professors in Madrid who built the house about 30 years ago and have spent their happiest moments here. As I know the house well, have had excellent experiences renting out our own country house in the Sierra de Gredos, and can attend our guests in several languages, they have asked me to give them a hand with the holiday rentals of their country home. I am of Dutch-Argentine-American-German origin. Very comfortable and spacious villa in beautiful surroundings. 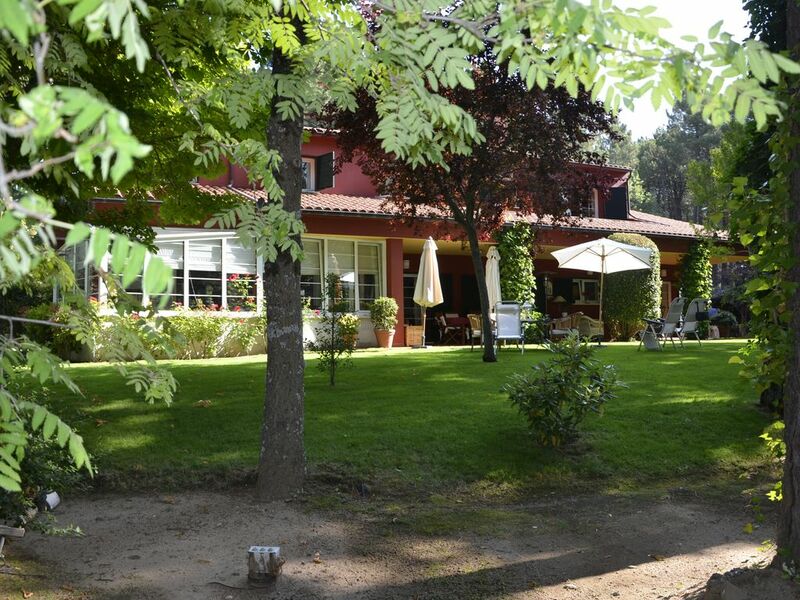 With access to a large variety of acitvities for all ages, and very close to Madrid. My husband, his brother, me and my two young children spent the week of New Year’s at The Red House. Viveca and the team were fabulous from guiding us around and orienting us to the house upon our arrival to quickly answering all of our questions during our stay and making check-out a breeze. The kitchen is better outfitted than any I’ve seen at a vacation rental property and the spaces around the house encourage both family togetherness (we played many games in front of the fire on the low table) and quiet time (my brother in law enjoyed reading on the sofa upstairs). Location was great for day trips to Segovia and Avila. The local town has a lovely grocery, supermarket, and assorted bakeries and cafés. Be warned that many of the roads in and out of the area are through hilly, mountainous terrain, so if twists and turns aren’t your thing, keep that in mind—the locals easily passed by us and no one was discourteous, but a few of the tighter turns were nerve wracking and we tried to avoid driving at night. The train station is very close and easy to get to, although we didn’t use it to get into Madrid, but that could be a way to avoid driving for those who want to. The neighborhood is essentially a gated subdivision and the houses are set far apart from one another providing privacy and quiet. We really felt like we had our own little estate. All of the information that Viveca provided about local shopping and dining was spot on and we had no issues finding food, etc. Of course, opening hours vary especially during holidays, so it is always best to check. Overall, a great property and highly recommended. The Red House was an amazing place to stay. Set in an incredible location within a peaceful fir forest, the accommodation was extremely spacious, with well appointed bedrooms, an enormous en-suite to main, and so many areas to sit and take your time, both inside and out. We loved having breakfast outside in the mornings, listening to birdsong and watching the red squirrel, and the evenings were magical eating out in the fresh air. It was a great place to relax and recharge the batteries. Cuidad Ducale was a very pleasant place to walk or cycle through. Plenty of interesting places to visit close by including Sergovia, Avila, Salamancar and the amazing monastery at El Escorial. You can reach Madrid by train from the local station which is five minutes drive away. Some great butchers and bakers in nearby Las Navas des Marques together with small supermarkets which stock most of your needs. Viveca was always available at the end of the phone for advice, and we experienced a very warm welcome from Estaban with the aid of Google Translate and a great sense of humour. Loved our stay and really miss the serenity and peace now we are at home, but we have some great memories! Thanks for sharing your magnificent home with us. Our stay here was fantastic from start to finish. The forest setting is beautiful and so peaceful. The house and its gardens are amazing and fabulously spacious for our group of 5. We were brilliantly looked after both before and during our stay by Viveca and Esteban. It just felt like an enormous privilege to spend a week in such a perfect place! Highly recommended! All in all a super stay and I will definitely enjoy staying here again. Een prachtige vrijstaande villa, gelegen in een mooi bos in de nabijheid van een dorp. We verbleven met 3 stellen een lang weekend (5 dagen) in de mooie villa in de maand oktober. Helaas zat het weer niet mee en konden we helaas niet genieten van het schitterende terras van de woning. We hebben de oude stad van Madrid bezocht (ruim een uur rijden). Hierbij het advies van Viveca opgevolgd bij het vinden van een parkeerplaats, hetgeen probleemloos is verlopen in de directe nabijheid van de vele bezienswaardigheden. Dichtbij gelegen was ook het prachtige kloostercomplex El Escorial, dat toevallig vanwege de feestdag in Spanje die dag gratis toegankelijk was. Ook prachtig om te bezoeken zijn de bezienswaardige plaatsen Avila en Segovia. De zeer ruime villa was een prachtige plek om ’s avonds terug te keren, was zeer compleet en van alle comfort voorzien. Top!!! Unas vacaciones perfectas. La casa es preciosa, limpia, bien cuidada y muy cómoda. ¡Y el jardín! La enorme parcela está dentro de un pinar espectacular, con un lago cercano y mil sitios para pasear y explorar en medio de la naturaleza. Muy recomendable. Un lugar tranquilo, seguro, silencioso. Ideal para niños. Repetiremos sin duda. Gracias a Viveca y Esteban por su excelente trato y amabilidad. The Ciudad Ducal gated community is located on what used to be the grounds of the cosmopolitan Duchess of Medinaceli (who had an iron-and-wood outlook tower built on the land by Eiffel or one of his pupils), and forms part of the Sierra de Malagón, limited by the Guadarrama Mountains. Due to its agreeable climate and proximity to Madrid, Las Navas del Marqués, the closest town at 2 km. from the house, is a traditional summer resort for Spanish cultural figures, from Vicente Aleixandre to Camilo José Cela. Today it still has a lively cultural scene, especially in summer. It also has some interesting historical monuments. The community is set in a wonderful landscape, and both within the community as in the surrounding countryside one can make wonderful hikes and bicycle rides. The closest shops are in the town of Navas del Marqués, which also has an indoor swimming pool that is open all year round. Both the city of Avila, with its grand and perfectly preserved medieval city wall, and the impressive monastery of San Lorenzo de El Escorial and the charming town are within 30 km. from the house.